Toronto duo Freedom Or Death made a bold statement with their 2010 debut EP, which caught the attention of bloggers and landed them on many 'bands to watch' lists. On April 26th they try to build on a stellar CMW with the release of an EP of new material, Ego. After the brief swirling introduction track "Eight", the EP morphs into "Inside". The track is constructed with electronics, loops, and samples, which work together to create an intense yet slick atmosphere. The song seems to take inspiration equally from '80s gothic Depeche Mode and TV On The Radio. The solid drum machine kick of "This Crowded Room" does little to dissuade the TVOTR comparison, while "Human" makes use of a synth line that wouldn't sound out of place on a Human League record. The band also have a funky side. The incredibly fat bassline on "Elefant" will attest to that. A delicate acoustic guitar line is the basis for "Virgina Woolf" shows that Freedom Or Death is comfortable and capable in a wide range of styles. With all of the vibrant things going on with the musical arrangements it becomes easy to overlook the importance of the vocals on these songs. The vocals are rich and deep with emotion. When they need to add a sombre texture to the music they do. When they need to power a soaring chorus, they are up to that task with equal aplomb. 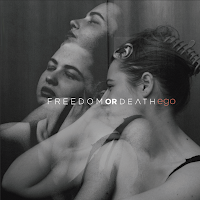 Think The Dears' Murray Lightburn and you'll get a sense of what to expect from Freedom Or Death. The EP wraps up with a hidden track, an acoustic version of "This Crowded Room". There are countless bands that get hyped every day on the Internet. With Ego Freedom Or Death separate themselves from the masses and give no reason to believe that they are not the real deal. Freedom Or Death play a CD release party at the Steam Whistle Brewery on April 29th (the previous contest to win passes to the show is still open here).